As specialist in this area, our service goes far beyond just that of a Real Estate agent and go much further than just providing a new home! Promoting your interests, our years of expertise, as well as providing appropriate solutions, that´s our common thread in our work. We are an ndependent company with a positive attitude. We are able to assist in an optimal way during your search. Our commitment is our strength and guarantee for your customer satisfaction. Let yourself be surprised! MALIMI, from an alternative successful education project to a Real Estate agency. This event perfectly suited to realize children dream´s as adults as well. Stimulating to express themselves by capacities like "creativity and originality" was our start for a future expension..
MALIMI Workshop, "Another perspective on money" recognized as a work tool for secondary school, supported by Canon organisation, Education governement, seems more and more popular. Getting people a wider awareness on the influence of uncounsious thinking was a main goal. Inspired by a personal everyday practice in banking along with an personal approach due to a specialized training seems succesful! Without an open mind it is unable to grow!. MALIMI Advice center, service of protection of your interests. A basic rule and leads us to further grow. Providing advice based on individual intensive counseling proves to be succesfull. This kind of personal development offers a wider personal perspective and well-being. Our main vision on services with a heart, became our symbol! MALIMI Credit - and Insurance brokers office, offering mortgages and insurances, a growing activity results to expansion of the business. Our activities are based on an ethical perspective on banking, along with our vision "specialist in your insurance, protection of your interests with a hart restores all into practice. By support of a Spanish construction company specialized on building new homes for more then 30 years of experience, our interest into Spanish Real Estate was gradually growing..
MALIMI COSTA BLANCA SL, Real Estate and Insurances company was founded in 2004 in Rojales, Along with a vison to offer services with a heart as our main goal, always will satisfy potential byurs or clients. By some international oriented business-managers arises the idea of a local "business to business group" España, known as BGE España,. Networking also on the Costa Blanca, seems an important tool to create a successful business. 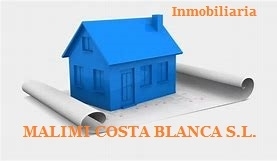 From start, Malimi Costa Blanca represents the Insurance profession and later on Real Estate activities.